Mapped wind speed contour lines delineate wind speed increments of either 5 mph or 10 mph and are not intended to represent a zone's fixed wind speed. Linear interpolation of wind speed between contour lines is permitted. For example, a building situated halfway between the 120 mph and 130 mph contours could be designed for a wind speed of 125 mph based on linear interpolation. Alternatively, a design wind speed of 130 mph6 could conservatively be used. In addition, wind loads may vary based on the building's response characteristics. Provisions of IBC Section 1609 apply only to structures of shapes that do not have unusual response characteristics and which are located on sites that are not subject to channeling effects or buffeting in the wake of upwind obstructions. Channeling, for example, would occur when wind speeds are magnified due to the venturi effect as they are directed between tall buildings, thus subjecting downwind structures to higher wind speeds. Should unusual circumstances exist, the design wind loading must be determined by wind tunnel tests or nationally recognized data. 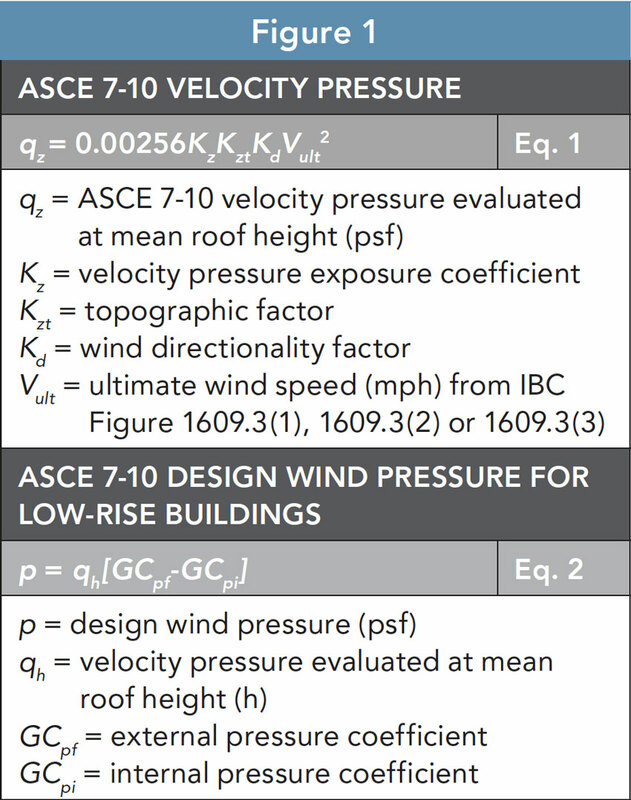 As an example of design velocity pressures for specific building locations and risk categories, consider the tables on page 4. All locations identified are within the hurricane-prone region with the exception of Dallas, Texas. As can be seen, for a given location, design velocity pressure in accordance with Equation 1 varies by risk category and exposure category (see Figure below). For example, for Exposure C in West Palm Beach, Fla., a Risk Category II building has a design wind speed of 170 mph while Risk Category III and IV buildings have a design wind speed of 181 mph. Further, design velocity pressures vary for the same risk category when the exposure category changes. And, as can be seen, design velocity pressures for buildings subject to Exposure D are noticeably higher than for Exposure C.
▶ Exposure B. For buildings with a mean roof height of less than or equal to 30 ft, Exposure B shall apply where the ground surface roughness, as defined by Surface Roughness B, prevails in the upwind direction for a distance of at least 1,500 ft. For buildings with a mean roof height greater than 30 ft, Exposure B shall apply where Surface Roughness B prevails in the upwind direction for a distance of at least 2,600 ft or 20 times the height of the building, whichever is greater. ▶ Exposure C. Exposure C shall apply for all cases where Exposures B or D do not apply. ▶ Exposure D. Exposure D shall apply where the ground surface roughness, as defined by Surface Roughness D prevails in the upwind direction for a distance of at least 5,000 ft or 20 times the height of the building, whichever is greater. Exposure D shall also apply where the ground surface roughness immediately upwind of the site is B or C, and the site is within a distance of 600 ft or 20 times the building height, whichever is greater, from an Exposure D condition, as defined in the previous sentence. 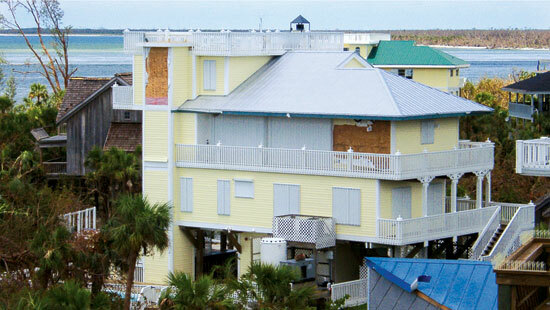 After Hurricane Charley, FEMA noted no structural damage to new wood-frame buildings built to the 2001 Florida Building Code standards.